Guts Christmas promotion 2016 - tons of presents are waiting to be unwrapped! This year, Guts claims to they will be "Making Christmas Great Again". And they are keeping their word, as their Christmas promotion is indeed very exciting this year! You can choose the gifts you prefer and send the casino your wishlist. There are some exciting gifts waiting, including 4K TVs, a Mini Cooper and headphones. The promotion starts on December 1st and ends on December 25th 2016. First, you need to click on the present icon that you can find at the top of the page. Then select one gift for each of the six wishes. When you are done send the wishlist to Santa which will confirm your choice. All you need to do then is to play the games, including slots and live dealer games. Every day you can get a boost when you answer a festive question. In order to claim your presents from the wishlist you need to play the games. While you are playing a progress bar will fill up and once you've reached the target the gift will be unlocked and you will play for the next. You can also change the wishlist if you change your mind about the gifts. Keep in mind that it is best to play games from the categories Video Slots or Other Games, as they contribute most to the progress bar. Classic slots and live games contribute much less. You can unwrap the free spins or money gifts on December 26th, but physical gifts will take until January to be delivered to you. The promotion is available for players who have played between October 1st and December 25th and made a minimum deposit of €30 and wagered it too. The promotion is exclusively available for players registered in and residing in the following countries: Australia, Austria, Canada, Finland, Germany, Gibraltar, Greece, Ireland, Malta, The Netherlands, New Zealand, Norway, Saudi Arabia, South Korea, Sweden, Switzerland, Taiwan, United Arab Emirates & the United Kingdom. Before taking part in this promotion, make sure you read the full terms and conditions that you can find on the website. 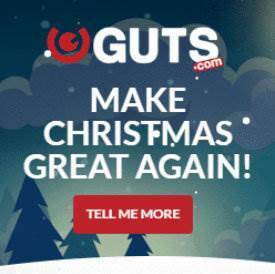 Send Guts Your Christmas Wishlist Now! As a new player at Guts you can also take advantage of a fantastic welcome offer of 100% up to £300 and 100 free spins!